You can upload files to both user and group files. 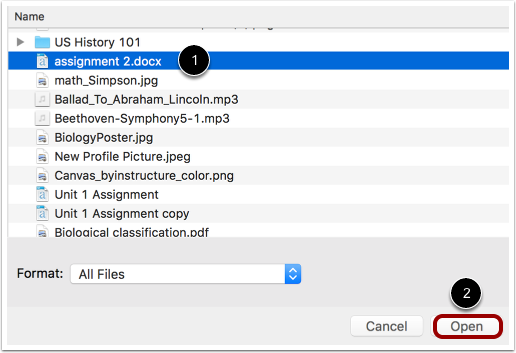 Files can be used for assignments, discussion replies, and conversation attachments. Additionally, files in your user or group files can always be embedded in Canvas using the Rich Content Editor. Learn how to locate your user files and group files. 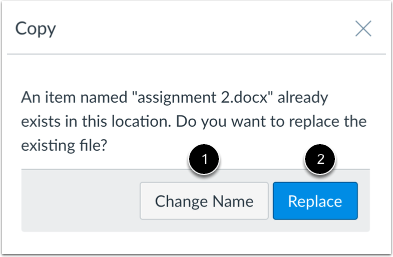 For assignment submissions, you can upload a file from your computer or select a file that has been previously uploaded to your user files. If you select a previously uploaded file, you can delete the file after it has been submitted and free up extra storage in your user files. In user or group files, click the Upload button. Click the title of the file(s) you want to upload  and click the Open button . Some web browsers contain a feature that allows the user to add to files by simply dragging and dropping the files from a file window directly into the Canvas file repository. Click the title of the file you wish to add  and drag the file to your open browser . Your file will automatically upload. Previous Topic:How do I create a folder in Files as a student? Next Topic:How do I preview a file as a student? Table of Contents > Files > How do I upload a file to my user or group files? Re: Any Progress with Canvas Associating Groups to Specific Courses? Re: How do I upload documents? Re: How can I add a picture onto the assignment post on discussion?